Building a house is obviously very important and the most important thing is the materials and quality of the material that is being used in the construction process. Very few people have deep knowledge of the materials that they are using for construction. Here we will be talking about one such very important material that plays a fundamental role in the construction of structures. If you have ever seen a building constructed around you and you noticed the thin straw kind of steel bars hanging in the concrete that’s the TMT Bar. It works as a solid and steady force in the concrete. It gives a boost and strength to the concrete. It has great thermal compatibility and durability in the concrete environment. TMT bars are made through amazing composition and due to which it shows excellent ductility, bendability, corrosion resistant and tensile strength. So there are four different grades of TMT bar available in India – Fe415, Fe500, Fe550, Fe600 and highest grade of the TMT bar will be the strongest. Higher grades TMT bars are used on the floors and roof because it’s the most important part of the building. Lower grades TMT bars are generally used for constructing few decorative kinds of stuff, railings, balcony railings etc. Obviously, when you are going to use TMT bars, there would plenty of moisture around and hence the bars should be corrosion resistant, otherwise, the longevity of the bars would be very less. Prime Gold TMT bars are the most reliable ones because they provide superior quality, its corrosion resistant, high strength, ductility and also match the International standards. It provides TMT bars all over India and also the top leading manufacturer in the Steel industry in India providing superior quality. 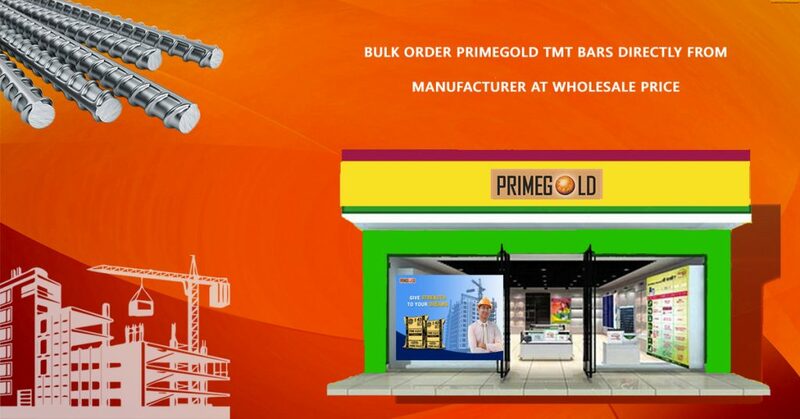 Prime Gold TMT bars would obviously be the best as it has a brand name and provides high-quality products and very reliable and of course the materials are used for constructing buildings, dams, flyovers etc, so you cannot just use any unreliable material. 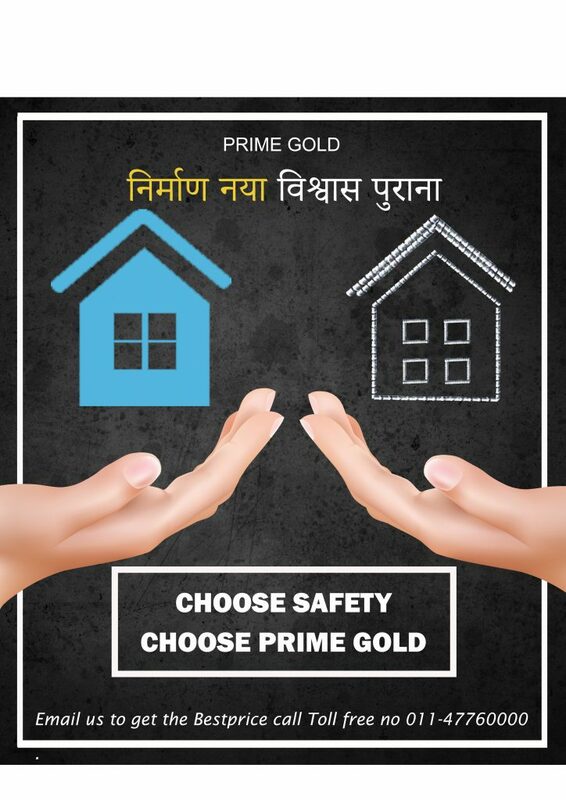 Prime Gold is into the industry for over 34 years now and has a reputation for delivering quality products at an affordable price. Founded in 1984 by Shri Pradeep Aggarwal, Prime Gold Group have been one of the most preferred brands every since for TMT bars. They use the latest TEMP core technology and no compromise whatsoever is made with the quality of the product and this is what makes it the most preferred brand for construction materials. The products are in huge demand in each of these regions because of the quality that they offer at a very competitive price. Prime Gold is into the manufacturing and supply of Stainless Steel Pipes for the last 34 years and has a reputation for consistently delivering high-quality products all across the nation. Based in Bangalore, Prime Gold is the most trusted Stainless Steel Pipes manufacturing company in the entire nation. We have established ourselves as a rock solid foundation in the manufacturing and exporting of stainless steel pipes. We have a team of well-trained employees who are committed, sincere and hard working. Our technical knowledge combined with quality maintenance and a hard-working team of professionals has helped us in reaching this position. At present, our products are widely used across diverse industries ranging from construction to thermal to oil and gas refinery to solar and nuclear power and so on. We have expanded ourselves strength-to-strength by achieving our set goals and growing our clientele across the nation. Stainless steel is recognized as a versatile material in the construction industry and has diverse application and utility from residential structures to high rise towers and corporate structures. They are made of steel alloy mixed with a small amount of chromium. 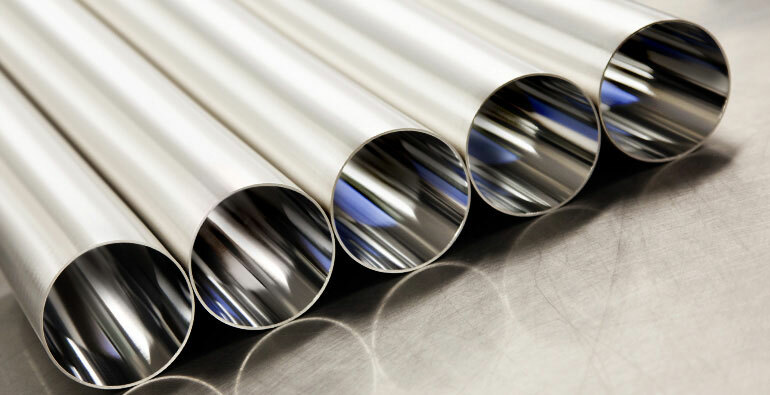 As because stainless steel is resistant to oxidation and is also very easy to maintain, it is widely used in the manufacturing of pipes and tubes. Seamless Stainless steel pipes mostly have their application in industries where a lot of internal pressure is given on the pipe for instance in processing equipment, water treatment companies, and marine industry. On the other hand, welded stainless steel pipes have its application in industries wherein the pipes are exposed to the corrosive and harsh environment. Prime Gold’s stainless steel pipes are available in diverse grades, size and finish to suit the needs and requirements of different industries. The products can also be easily customized to meet the urgent needs of the customers. As because stainless steel pipes have to come in contact with water constantly, these are manufactured with SS 304 and 316L grade that assures the ideal quality requirement for the pipes. Each of our products come with specification detail of material and dimensions. Customers can also purchase the fittings required for fixing the pipes like socket, elbow reducers and so on that are available in different sizes at an affordable price. All products manufactured by Prime Gold are double checked to ensure that the products delivered to the customers have zero defects. Fastest delivery of products in the entire nation ensuring that the needs of their customers are taken care of at the right time. Special care is taken that the products are well packed and delivered to the customers ensuring that no products are damaged at the time of transit from one place to another. In the construction industry, TMT Bars are one of the most commonly used product and has huge demand. These bars are manufactured through a metallurgical process known as thermo-mechanical treatment and have some impressive advantages which make it so popular in the construction industry. Fire Resistant: Prime Gold TMT Bars are completely resistant to fire and are able to withstand temperature up to 400°C to 600°C. Ductile and Bendable:Our TMT bars are very high ductility which makes it very easy to bend these as per the need. This, in turn, helps in reducing the time spent in fabrication and construction by allowing to create pre-welded meshes. Earthquake-resistant: Our TMT bars have a tough outer core and a soft inner core that helps them to withstand tremors of earthquakes. Strong Bonding Capacity: The unique rib like the design on these TMT bars increases its bonding strength between the bars and the concrete. Corrosion-resistant: Prime Gold TMT bars are extremely resistant to corrosion and are very efficient to withstand the ability to withstand the formation of rough carbides. These carbides are responsible for the corrosion of an untreated bar. 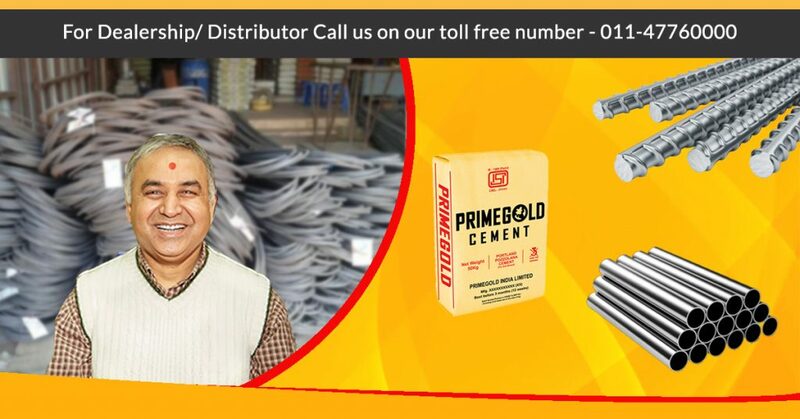 Being the top leading manufacturers in the steel industry in India, Prime Gold International Limited is famous for providing high-quality TMT bars all across the nation at the best price. Superior quality reinforcement bars manufactured by Prime Gold have unique rib patterns that ensure superior strength and ductility thus matching the International quality standards. Prime Gold have a team of dedicated professionals who are highly responsible carefully monitor the manufacturing process to ensure that no compromise whatsoever is made with the quality. Our highly experienced and dedicated team of engineering and technical team and metallurgists are kept looking for better ways to ensure high-quality products, which are cost effective as well. High Product Quality: Prime Gold TMT Bars have a reputation of consistently manufacturing best quality TMT bars. Prime Gold TMT Bars offer better resistance to corrosion and high temperatures, reduced construction time, consistent properties, and high ductility. Fast Delivery: Fast and efficient material delivery is our USP. We understand the mindset and urgency of the distributors, hence we provide seamless and timely delivery to them. Round the year availability: We ensure that our TMT Bars are available throughout the year, this means that our customers can step into our distributor shop and will never leave empty-handed. Fair Business Practices: We deal fairly with our distributors and fulfill all order commitment at the agreed upon rates, rates fixed at the time of placement of order. Strong relation oriented culture: We believe that a strong relationship that is sure to benefit the company as well as the distributor thus creating a positive relationship through which each is able to expand their business. Sales Support: Our managers provide potential leads to the distributors and also provide complete assistance as and when required helping them to grow their business. Marketing Support: We are involved in full-fledged marketing activities in print media, radio, wall paintings etc that helps in generating quality leads for each of our distributors. To sum up, we can say that by enrolling to be a TMT bar dealer with Prime Gold you can be rest assured to grow along with the company with its quality assistance and services. TMT is the abbreviation for “Themo Mechanical treatment” and this refers to way these TMT bars are manufactured. TMTs bars are widely accepted by civil engineers, contractors and government employees due to the properties that it has got to offer that makes them much better than steel bars. TMT bars are the most important material in the construction industry and are used for building homes, bridges, flyovers, and mostly all civil engineering structure construction. 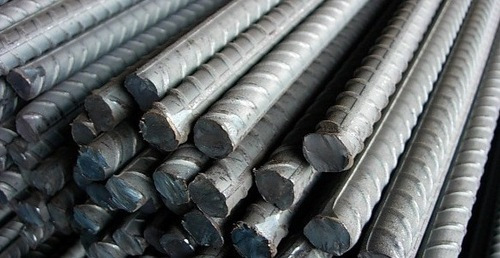 TMT bars are manufactured through a metallurgical process that involves compression, forging, rolling etc combined with thermal processes like heating treating, rapid cooling, etc On the other hand, steel bars are the cold rolled mild steel bars that are not only cheap but are very brittle and in unable to withstand high stress. Purchasing TMT bars directly from the manufactures will help us in cutting down the cost of middlemen which would in turn help us in cutting down the overall cost of construction. Purchasing the TMT bars directly from the manufactures will help us in purchasing these at a much lower wholesale prize. Buying products directly from the manufactures is a win win situation for both manufacturers and buyers as it reduces their dependency on third party for their buying and selling need. When planning of buying TMT bars from the manufactures one should first research on top manufacturers in the market, the approx. pricing at which they are offering the bars and the areas at which they would be able to deliver the products. This basic knowledge will play a very significant role in helping us shortlist few top players in the market. Next thing that one should be considering is the reputation of the manufacturer in the market. Understanding what people think of the brand will help you in finalising the manufacturer. There are many TMT bars manufacturers in the country, and Prime Gold International Limited is popular and widely trusted not only in our country but the across the globe. They are into providing superior quality TMT bars since 1984. Due to bulk manufacturing along with strong network of dealers and distributors helps Prime Gold to deliver supreme quality products to their clients at a very competitive rate. Prime Gold have a reputation of offering the strongest and long life TMT Bars. They have segregated the TMT Bars into grades – Fe-415, Fe-500, Fe-550, and Fe-600 (the numbers refer to the yield stress of each of the bars). Higher the grade; better the quality. Therefore, bars with higher grade are used for RCC constructions i.e constriction of roofs and floors. Lower grade bars on the other hand are used for construction in the balcony, fencing etc. Versatile with manufacturing grades as they are available in 4 different grades each with different stress yield. The good news is that we are now expanding our market and customers can easily buy prime group products online. There was huge demand for our diverse range of construction products and on request we have now agreed to make this facility available for all of our customers. Rubbing Test: Good quality cement when rubbed between fingers should feel smooth. Signs of any sort of roughness indicate that the cement is contaminated with sand. Float Test: Take some cement from the cement bag and throw it in water. Good quality of cement will float for a while before settling down. Setting Test: Immerge a thick paste of cement into the water for 24 hours. Good quality of cement will not develop any cracks. Strength Test: Last but very important means of understanding if the cement is of good quality or not is by understanding its strength. A block 25X25X200 mm should be prepared. This block should now be immersed into water for 7 days at a stretch. Post 7 days, place the block of cement on supports that are around 15cm apart. Now load it with 34kg of weight. If the quality of cement used in preparing the block is good, there would be no signs of failure. 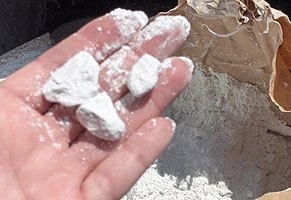 These are a few easy methods that one can use to check the quality of cement at home. Thermo-Mechanically treated bars are often referred to as TMT Bars. These are high strength reinforcement bars that have a very tough outer and a delicate inner core. These bars are made from steel and possess qualities that made them most apt to be used for construction projects. Latest technology – Prime Gold TMT bars are manufactured through latest Temp-core technology. This ensures that the TMT bars are durable for a longer period of time. Earthquake Resistant – Prime Gold TMT Bars are specially designed so as to make them earthquake proof. These have a high elongation point that helps them in elongating in crisis situations without actually compromising on the actual measurement or the quality. This property of Prime Gold TMT bars makes them a perfect resource to be used in earthquake prone areas. Superior Bendability – Bendability refers to the elasticity property of TMT Bars. Prime Gold TMT bars are specially designed to ensure a great degree of elasticity to each of these bars and this gives them superior bendability. Resistance to Corrosion – TMT bars are often exposed to moisture for a very long period and hence Prime Gold TMT bars are manufactured them in a way that ensures them to be resistant to rust and corrosion. This anti-corrosive property of these bars help in extending the lifespan of these bars. Price is subjective to the quality and quantity of order. However due to bulk manufacturing along with strong network of dealers and distributors helps Prime Gold to deliver supreme quality products to their clients at a very competitive rate. Prime Gold have a reputation of offering the strongest and long life TMT Bars. They have segregated the TMT Bars into grades – Fe-415, Fe-500, Fe-550, and Fe-600 (the numbers refer to the yield stress of each of the bars). Higher the grade; better the quality. Therefore, bars with higher grade are used for RCC constructions i.e constriction of roofs and floors. Lower grade bars on the other hand are used for construction in the balcony, fencing etc. 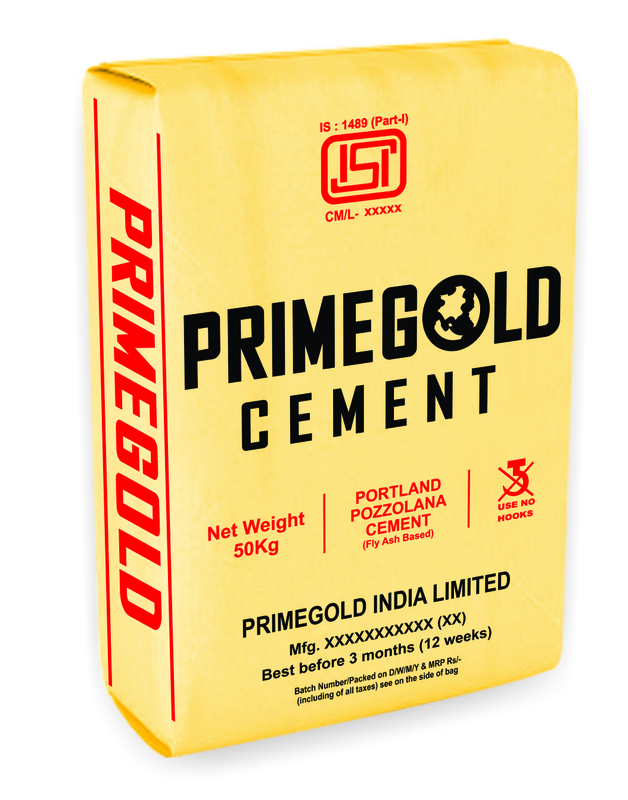 Being in the industry for over 34 years, Prime Gold Group is popular for providing high quality, assured construction products across pan India. Over the years, they have a build a reputation of being esteemed players in the market. In due course of time, Prime Group has managed to build a strong group of distributors and dealers in major cities in India such as Delhi NCR, Gwalior, Tamil Nadu, Kolkata, Jharkhand, Hyderabad, Raipur, Gujarat, Punjab, Andhra Pradesh, and Uttar Pradesh. Demand for their services is observed all across pan India and in the international market like Godrej, Reliance Communications, Prestige Group, JMD quality constructions, Fresco food services, Ajnara India Ltd, Omaxe, Chartered housing ltd, etc. The good news is that they are now expanding their market and their customers can easily buy prime group products online. There was huge demand for their diverse range of construction products and on request they have now agreed to make this facility available for their customers. TMT Bars – They are one of the leading manufacturers and suppliers of TMT Bars across India. Primegold TMT bars are of supreme quality with distinctive rib design embossed that gives stability, durability, hold and ductility matching up to international BSI standards. They have a high experienced team who are pro at their job and deliver best products and also work on finding innovating ways to improve the performance. Cement – They are the industry leader for manufacturing of high quality cement that is popular across India that is used for diverse purposes, from road construction to residential buildings. They are firm believer of quality management and hence no compromise whatsoever is made in terms of quality and this is their secret behind being able to deliver supreme quality cement. Stainless Steel Pipes: Prime Gold Group pioneers in production and supply of stainless steel pipes across India. Prime Group Stainless Steel Pipes are known for its high durability and salutariness. 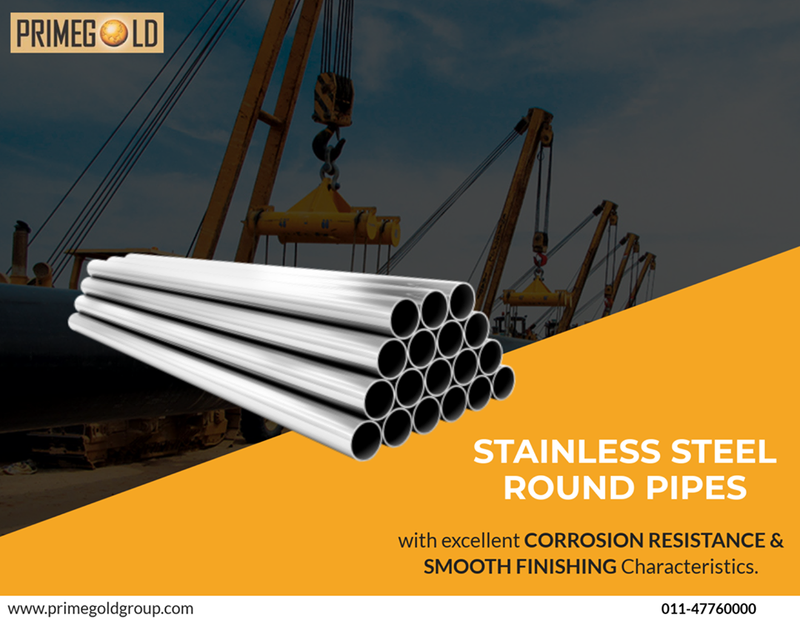 Stainless steel pipes are play a very important role in construction and hence Prime gold group manufactures them in S 304 and 316L so as to not compromise on quality. Over the years Prime Gold Group has built trust, reputation in the market. Their quality and price are two things that can never be questioned. The good news is that all these products are now easily available and one can buy it online very conveniently. Choose your best TMT bar partner, But How? Constructing a durable and strong building required the best building materials, especially the best TMT bars. Being a competitive market, there are many major TMT bar companies that you can choose from. The manufacturing process of a TMT bar is of utmost importance. The best TMT bars are when they are manufactured using the latest Tempcore technology. Another factor to consider is the length and width of the TMT bars, which varies depending on the requirements of the building. Strength and quality can be analyzed using the grades of a TMT bar. Some of the grades you find in our country are FE- 415/500/500 and 600. Higher the grade, higher the strength of the TMT bars. Always ensure that the TMT bars carry ISO certification. ISO certified brands ensure strict quality control measures. This also ensures a higher sense of safety and security. Always do a naked- eye test before purchasing TMT bars. The main factor to check and analyze is if every meter of the TMT bars have got their logo or not. Other factors to evaluate are if the bars are rusty, are they fresh looking, and also are they of equal lengths. They should also be corrosion and water resistant. Why do we use TMT bars in construction and not others? TMT bars are preferred for construction purpose because of many reasons. It’s unique and special properties have made it ideal for construction works. They are extensively used in different types of civil construction projects like residential buildings, high-rise commercial buildings, bridges, dams, flyovers etc that bear the weights of people and other massive things. They are used in construction purpose because of its high tensile strength which can bear the entire weight of the construction and things on it. They are famous for its high ductility, bending and elongation property and for its resistance towards corrosion, temperature, earthquake and other natural inconveniences. Normally in India TMT bars comes with 4 grades. Fe-450, Fe-500, Fe-550, and Fe-600 with the numbers being the yield stress. The TMT bars with more yield stress (one with the highest grade) gives the better quality and more strength and so the long-lasting structure. Lower grade bars can be used for balcony, fencing and other decorative constructions and higher ones for large RCC constructions such as roofs and floors. TMT bars have excellent bending capacity. Due to their flexibility, they can be molded into different shapes by bending them up to an extent which ensures the modern living style. TMT bars are completely earthquake resistant because of its elongation property. In fact, it can elongate up to 50% more than its original length without compromising on the measurements which helps to save on the construction as well. TMT bars because of its corrosion free and moisture resistant property can be used in constructions along sewage drains and where it has to be dealt with water for example salinity in groundwater. The thermal resistance properties of TMT bars make them withstand any kind of fire hazard as it can bear a high degree of heat.